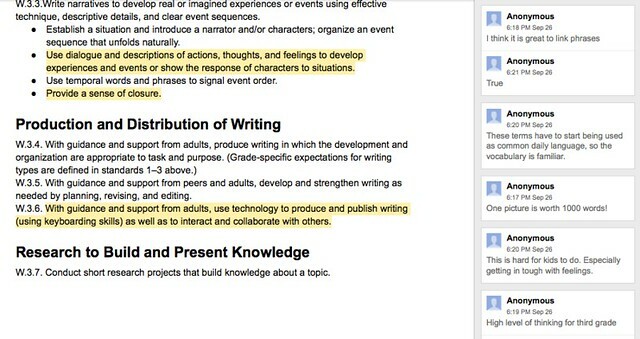 Some folks at DS106 were posting the results of an assignment called a “photoblitz,” but I recognized it as our “learning walk” idea from the Making Learning Connected MOOC. In either case, the idea is the same: take your camera for a walk and collect photos of what you are seeing. I went out early yesterday morning to our front yard, and used as best a photographer’s eye as I could to capture the world in that confined space. I realized that as autumn comes to New England, there are still plenty of colors hanging around, even after the rather cold nights. That became a theme of some of the photos. Others, I was searching for another way of looking at something common and familiar. 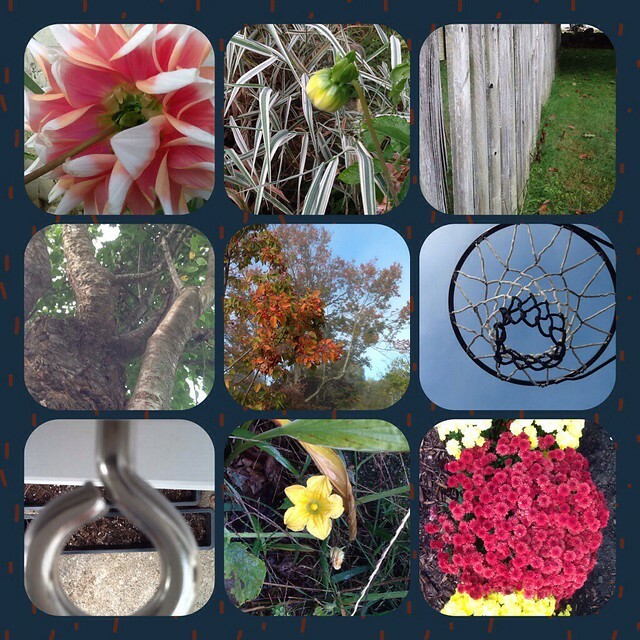 I pulled nine photos from my photoblitz into this iPad collage app. I am helping to facilitate a “DS106 Radio Show” team on the theme of hacking and disruption with technology. We are The Merry Hacksters and I am hoping we can pull it all together. The folks on the team joined in Google Docs, and we have a working document underway, and our show will eventually be about 20 minutes long. I created this comic as a title icon, but I don’t know if the others like it. And I am planning two podcast segments. The first involved my sixth grade classroom, and I worked on that for a few days this week. I had my students “hacking the game of chess” as I walked around with my voice recorder to capture a “sound story” of their creativity in bloom, and discussions underway. I then recorded a voice-over, with the kids mix as my background track, ending with a short bit of just listening to the students. Here is a little teaser of the sound story element. Meanwhile, I am asking two folks from Mozilla Foundation (Chris Lawrence and Laura Hilliger) to answer a few questions about the push towards more tools for students to remix the Web, and why that is important. We had started to talk about hosting a Skype session, but logistics and distance got in the way, so they agreed to record their answers and send me the mp3, and I will go about mixing it together. Speaking of audio, I am working on a few podcasts for a new blogging project I am involved in, which I will explain later in October. And I worked on a short rap for the Headless Course, just for fun. I did a few Daily Creates, too, including writing about a quiet space (always a good prompt) and capturing a transformation in time-lapse. I admitted to breaking the rules (which is OK with DS106) but bringing back a stopmotion video my son and I had done with a piece of clay that transforms into a man, and a dog (that was his idea and it was a great idea). 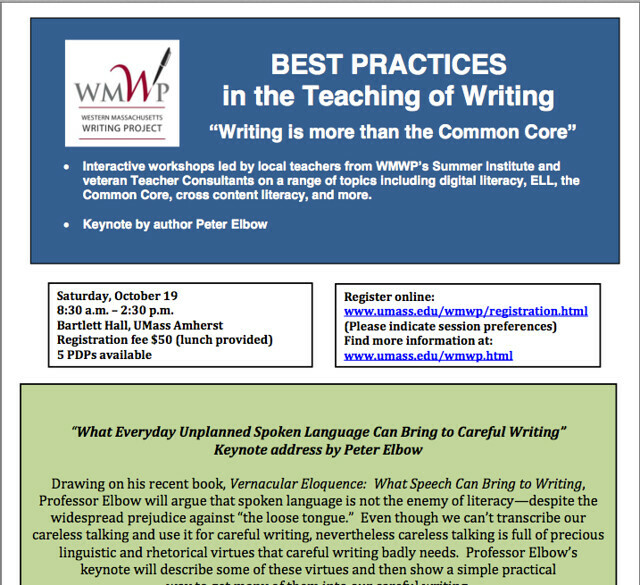 Our Western Massachusetts Writing Project’s annual Best Practices is coming up soon (Saturday, October 19) and if you are in our area, I invite you to considering joining this day of professional development around the teaching of writing. We are very fortunate to have the esteemed Peter Elbow as our keynote speaker, who will focus in on how we talk and what it means. And you can see from the title that we continue to push back on the Common Core expectations, and work to expand the ways in which our students are writing. The first event is this Monday (1:30pm PDT / 4:30pm EDT) and the link to get more information and register is here. What’s going to happen? Well, some interesting things. Folks are going to share thinking and making around Scratch, Webmaker tools, Minecraft, Arduino and more. I hope I can make it. I need to check our busy calendar. So, I know about half of them and other half, I was like … Oovoo? What the heck? Which is the point, right? But we (as parents, as teachers) need to be aware of these possibilities. Where else do you see your kids/students migrating? Someone over in DS106 had created a rap for the Headless Course a few weeks ago, and I decided to give it a try, too. I’ve made the audio file of the Gone Headless song shareable and downloadable, so feel free to remix it and mess with it and do what you want with it. Can I just say that working in the phrase “tech ambidextrous” to rhyme with “go headless” was a triumphant moment for me? If you wanna create — are you tech ambidextrous? I like this Prezi about Digital Culture put together by Gideon Burton (Thanks to Ian for sharing the link). I have not listened to the podcast of the presentation but there is a lot to think about in here. We’re just starting a short unit on plays and drama, as I break my classes into groups for some fractured fairy tales. They are a hoot, allow for collaboration and fun at the start of the year, and give me a chance to get some data on reading fluency. It’s a read-aloud activity, not a memorize activity, and completely low stakes. I bring this up because this morning, over at National Writing Project writing site that I am part of (known as the iAnthology), the host of this week’s writing prompt put up a post about writing “non-linear narratives” with fairy tales. I dove in, as I already had such stories on my mind this morning. It’s not easy being Rapunzel’s cat, you know? I’ve lost six lives already just jumping down from various windows trying to get her some help. What is it with these witches, anyway? Punz thinks they are just jealous of her hair but I don’t know. It must be something nuttier than that. You ever wonder if there is some writer in the cloud, crafting out our lives as stories and adding drama when things get a little boring? I do, although I can’t say there is a lot of rhyme or reason to how our lives unfold. I mean, we both heard about that tragic news story of the women who were held captive in that house for ten years. How do you explain that? Punz and I were sad, but understood that familiar tale. Although they had a monster, not a witch. And they did not have a cat. Still, here we are again, stuck in the upper room of an abandoned castle. I don’t even remember why this witch wanted her here. The stories are getting all fractured and confusing. Anyway, we spend our days in a routine. Punz combs her hair, which takes hours and then she starts over again, and I chase lose hair strands around the room until I get bored. You’d be surprised how many times I can do that, though. The chasing keeps me sane. And who can resist? Every other day or so, Punz tries to get me to jump again. The last six times … let’s just say I never want to do that again. But I care about this kid. She needs protecting. This morning, when she rubbed my head and hit that sweet spot under my chin, my defenses crumbled. I’m going. I’m jumping. And if it is anything like last time, it’s going to hurt. She is all smiles as I pull on these special boots I was given by another witch — I know! More witches! I can’t explain — as I hope they might break the fall a bit. Punz calls me, “My Hero, Puss in Boots.” If I had thumbs and fingers, I could just shimmy down her hair, the same way those heroes all have come up. Still, you should hear her cry when they use her hair as a ladder. That’s gotta hurt. I give Punz a goodbye rub of the back and tail, and savor a moment of cudding as she tells me I am the best cat in the whole world. 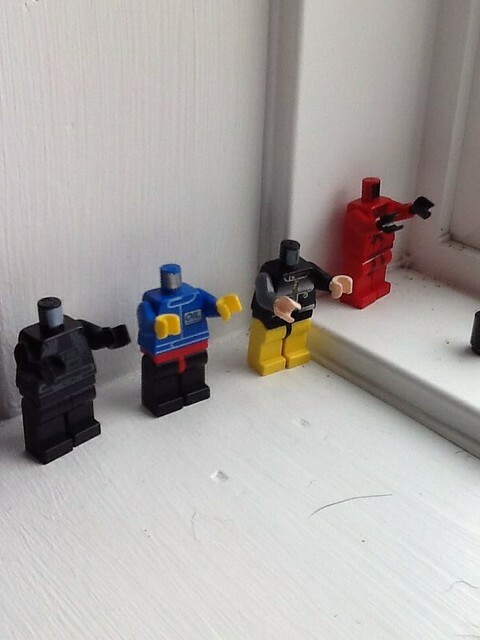 Then, I am up on the window sill. Then, in the air … falling, falling … Believe it or not, there is an incredible moment to think about what it means to be the kind of cat I am, a hero cat, whose mission in nine lives is to save the beautiful princess again and again. No one ever tells those stories. Not even that great writer in the cloud. Here’s a clip from my band’s (Duke Rushmore) show the other night as we cover Polk Salad Annie and get a little Elvis with it. That’s me on the saxophone.